While Keuka Studios fully operates out of our facility in a suburb of Rochester, NY, we work with clients all across the United States and the Caribbean. How does a family-owned business have customers for large-scale architectural metal projects so far away from its studio? Our unique design process allows us to create railing systems that seamlessly integrate into our clients’ residential or commercial space. After fabrication, we ship the final product to our customers’ job site. Because cable railing doesn’t obstruct a person’s line of sight or the natural flow of wind, this style of railing works perfectly for island properties that have extraordinary views. For more than a decade, Keuka Studios has provided railings for clients across the Caribbean Sea and North Atlantic Ocean. We have designed, fabricated, and shipped cable and glass railing systems for commercial and residential projects in The Bahamas, Turks and Caicos, the United States Virgin Islands, the British Virgin Islands, the Cayman Islands, Grenada, and Antigua. For island architectural design inspiration, take a look at these projects that Keuka Studios has collaborated with homeowners, architects, and builders to create. 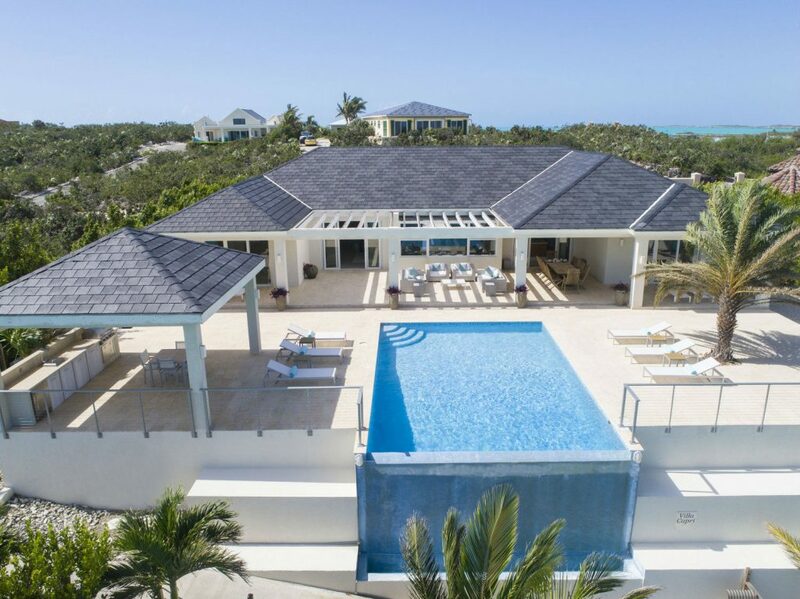 Keuka Studios provided an Ithaca Style railing for this lavish vacation villa in Providenciales, an island of Turks and Caicos. After the previously installed glass railing shattered during Hurricane Irma, the owners decided to invest in cable railing. Like glass, cable railing has a modern appearance and preserves panoramic views. The famous Yacht Club Costa Smeralda built a second location in Virgin Gorda, a part of the British Virgin Islands. Keuka Studios designed a custom cable railing system for the club house’s outdoor seating area. To match the marina’s nautical design, we used teak wood for the top rail and white powder-coated stainless steel for the posts. We also crafted a custom terminal anchor for the cable infills. This luxury pool deck has a direct view of the crystal clear water that surrounds the island. Because Turks and Caicos has different building codes than the U.S., we had a bit more freedom designing this railing. For example, the railing that faces the ocean does not have a top rail. As a result, the railing is hardly noticeable if you look through it toward the water beyond. However, top rails typically provide structural support for our railings. To ensure the safety of the railing system, we designed custom attachments with extended mounting plates. Keuka Studios designed a custom cable railing for the grand entrance of this home in Antigua. Even for indoor applications, many homeowners in the Caribbean choose corrosion resistant materials for their railings. Especially in homes with large windows and entryways, salt can permeate the air within the house. For this reason, we used stainless steel for the posts on this custom staircase railing. We also created a unique adjustable top post to allow for some height variation in the handrail supports. This alteration made it possible for the homeowners to install the mahogany handrail that they had hand carved by a local craftsman.